Summary: Blue Sargent, daughter of a psychic, has been told all her life that whoever her true love is, he will die. Thus, she has decided that it would probably be in her best interest to avoid boys in any capacity, and most especially, the rich, douchey ones who attend the nearby prep school, Aglionby. But on this particular St. Mark's Eve, watching for the spirits of the soon-to-be-deceased, Blue sees the spirit of one particular Aglionby boy named Gansey. Blue, who has no psychic power herself, has never been able to see any of the spirits before, and the fact that she saw his carries significance, and not just because he's going to die within the next year. Blue suddenly finds herself caught up with (the real, alive) Gansey, and he and his friends' desperate search for proof of ley lines and a long-lost Welsh king of legend. But as their search awakens magical forces beyond their control, old secrets and dangers also come to the surface that affect their group of friends. Thoughts: Not due to the writing itself, I had to read this book a couple chapters at a time, instead of slamming through it, and that was hard to do because it was all extremely interesting! 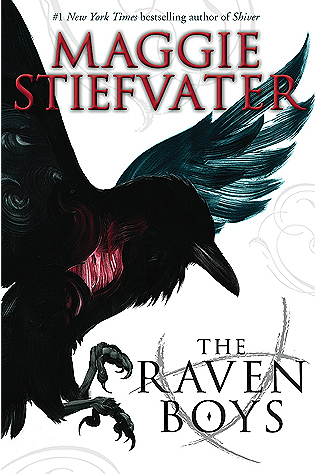 I've never read a story quite like this, and I really enjoy Stiefvater's writing style so far. The official summary (as well as the one I wrote above, I suppose) made it sound like a romantic supernatural story, but (and I don't think I'm spoiling anything here, but here's your warning, just in case) romance was not very present, at least in this book. (There are three more books in the series.) And you know what? I didn't mind that. There were hints of it here and there, but this book was very much a look at the lives of Blue, Gansey, and his three friends, Noah, Ronan, and Adam. They are all extremely different, with different backstories, united in this one all-consuming quest. I love character stories, and this very much felt like a character story with a long-term plot. (Again, hardly a spoiler, but the quest does not get resolved in this book.) Even though I know nothing about psychic stuff (dowsing? scrying? ley lines? ), I was still very much sucked into this world, so much that I was dreaming about it (after reading in bed). I can't wait to start book 2. Onwards!